Please share among institutions, producers, food vendors, and food & farming allies! Join your fellow Michigan Farm to Institution Network members for an interactive gathering the day before the Michigan Good Food Summit! In the morning, we are offering an optional Cultivate Michigan Member Orientation. This is an excellent opportunity for institutions who have recently joined Cultivate Michigan or those of you who are thinking of joining, to connect with each other and to gain a deeper understanding of where our local food purchasing campaign is headed. The afternoon event is open to the full network. We will use the lightning talks format to share brief stories, discuss how the network can continue to drive engagement in farm to institution and delve into areas of interest using open space topics generated by you! Follow the link below to register for one or both events! If you represent a Cultivate Michigan institution, please consider signing up for our morning orientation. Use the registration form in the link to RSVP. Please use the registration form to submit your ideas for open space topics. These will be small group discussions that cover an area of interest or work through a challenge in your farm to institution work. If you would like to share your story with the group, we are holding 6 spots for lightning talks. Each talk will be five minutes, and you can use one slide (or photo) as a visual. We want these to be a success story or a challenge story - something that other farm to institution practitioners can learn from or connect with. Use the space in the registration form to submit your idea. 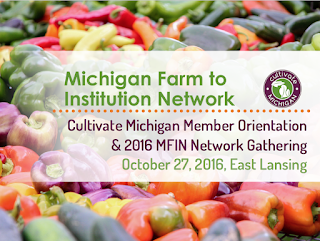 The Michigan Farm to Institution Network (MFIN) is a space for learning, sharing and working together to get more local food to institutions. We aim to meet the Michigan Good Food Charter goal of 20% Michigan food to institutions by 2020. The Michigan Farm to Institution Network is co-coordinated by MSU Center for Regional Food Systems and Ecology Center with support from MSU Extension. In 2014, MFIN launched a local food purchasing campaign designed to help ramp up farm to institution programs and track progress. To unsubscribe from this list, send an email with "SIGNOFF FOODSPEAK" in the email body to LISTSERV@LIST.MSU.EDU. Foodspeak is a listserv that connects growers, consumers, and everyone in between to create a community of sharing information relevant to food systems and the Michigan Good Food Charter. Content posted to Foodspeak does not necessarily reflect the views of Michigan State University, the Michigan State University Center for Regional Food Systems, or the Michigan Good Food Charter initiative.